Can we embrace the challenges? Can we observe emotions as internal events rather than being taken for roller coaster rides through the impulsive reactions and decisions that result from getting swept away by our emotions? The yogasana practice is the practice-lab that gives ample opportunities to learn to breathe through challenges and observe internal drama without letting it hijack your mind. Once we have this resilience, the challenges in life will propel us into spiritual growth spurts rather than tear us up inside and set us back. Here’s my challenge to you to try right now: hold chaturunga dandasana (the asana in the photo above) for 4 slow smooth breaths. Start in plank, learn to chill out here, with hands directly beneath shoulders, heels above toes, the whole body straight as an arrow, bend the elbows as close to 90 degrees that you can hold and keep your slow smooth breathing going! To modify if the low back is straining, release knees on the floor creating a straight line from crown of head to knees. Enjoy the challenge and feel your emotional resilience grow! 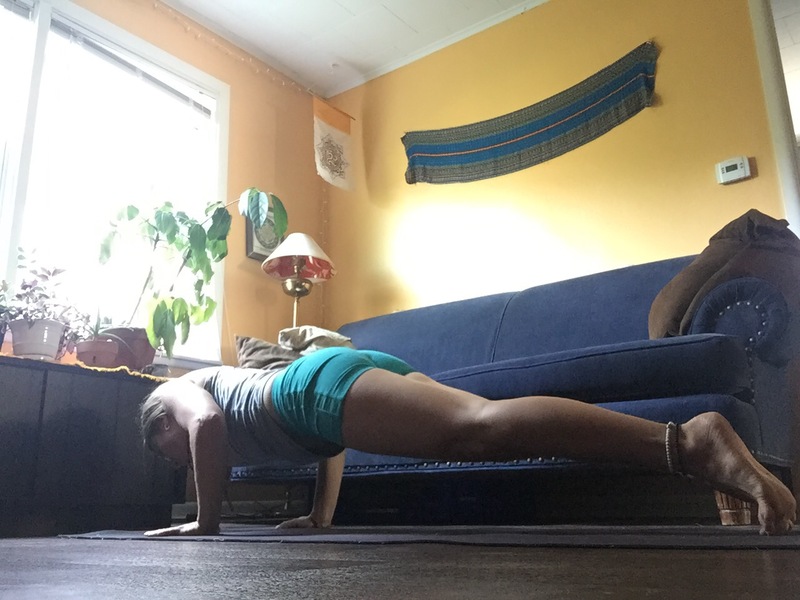 This entry was posted in yoga and tagged challenges, spirituality, yoga, yogasana. Bookmark the permalink.